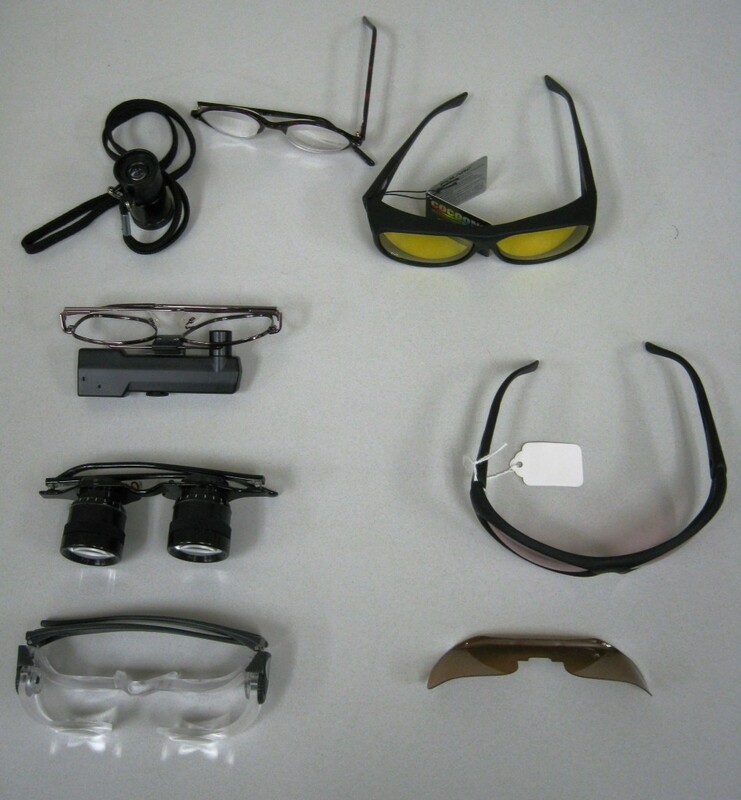 Many items may be found in our Vision Aids Catalog. Other items are dispensed by our professional staff after an assessment and training. We encourage you to view the Visions Aids Catalog. Orders can be placed by phone, fax, mail (braille or print), or email. 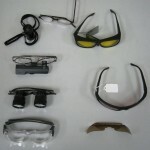 For the complete ordering process refer to the How to Order section in our Vision Aids Catalog. Prices are established based on the actual cost of the item and an allowance for related overhead costs. ABVI reserves the right to make price changes at any time without prior notice. Quantity discounts are not available. For more information on ordering, special orders, policies, warranties, etc., please click here. The following merchandise is on sale while supplies last. Large enough to hold 1 cassette. 3 raised dots at 15, 30 and 45; 2 raised dots at remaining 5-minute intervals; 1 raised dot at remaining 2-1/2 minute intervals. Face measures 4-1/4 inches and dial is 2-1/2 inches in diameter. Lightweight paper, used with slates; approximately 150 sheets per pkg. Heavyweight paper used for transcribing; approximately 500 sheets per ream. Heavyweight paper used for transcribing; 500 sheets per ream. We feature a variety of braille slates to meet all needs. Each slate comes with one stylus. Some slates have embossing slots for embossing tape. E-Z read slates have pins to secure the paper on the top of the slate. 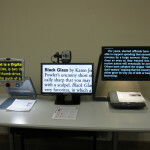 The user can read braille without removing the paper from the slate. It is particularly good for someone who does not plan to do much writing and does not want the expense of the other models listed above. 19-cell 6-line lightweight postcard sized slate, lightweight aluminum. 19-cell 6-line lightweight postcard sized slate. 18-cell, 4-line, lightweight aluminum. Writes oversized cells and dots, used without a board. Has slots for tape embossing. Can be purchased separately; to be used with regular slates. Replaces the 20/20 Pen Wide tip black marking pen. 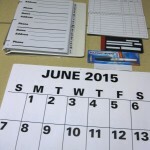 Spiral bound calendar with month tabs; When open 16 inches wide by 11 inches tall. Would make good planner. 18 inches wide by 24 inches high when open; letters and numbers 1 inch high; very readable black print on white background. Adhesive keyboard labels with enlarged letters. Specify color. Put one of these sheets on a page and the black print is easier to read due to the contrast on the page. Bold black lines are 3/4 inch apart and on both sides. 100 sheets per pad. Measures 8-1/2 inches by 11 inches. Unpunched. Writing paper with dark black lines for writing letters. Thick lines. Writing paper with dark black lines for writing letters. Very thick lines. 100 sheets with bold lines. A sturdy plastic mask (4 inches by 7-5/8 inches) with apertures corresponding to standard “address to” and “address from” areas. Plastic envelope writing guide with plastic back to help keep business envelopes in place when writing. 8 inch by 11 inch sturdy plastic sheet with 13 apertures corresponding to standard line spacing. Writing guide which fits over 8-1/2 inch by 11 inch piece of paper; has sturdy plastic back to help keep paper in place. 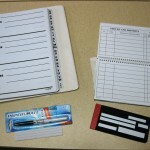 A thick plastic, folding check writing guide that has a frame to hold your checks in place while you are writing within the cut-out windows. This sophisticated check writing guide has a cover that snaps shut and living hinges that withstand years of use. It can easily be carried in a purse or pocket with several checks inside. To use, slide a standard check into the guide, and use the openings to assist in writing. This guide can also be used to endorse checks and to fill in Travelers Checks. 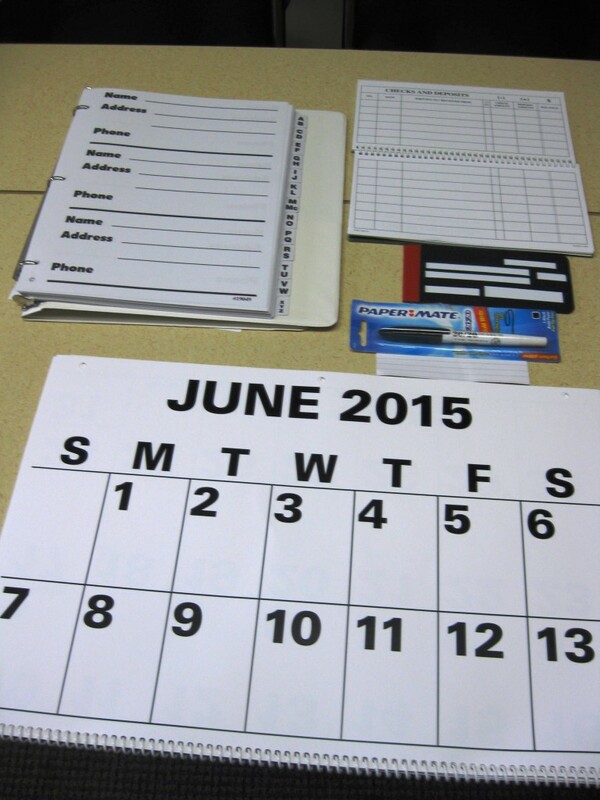 A template for filling in necessary information on a standard 3-3/4 inch by 6 inch check. 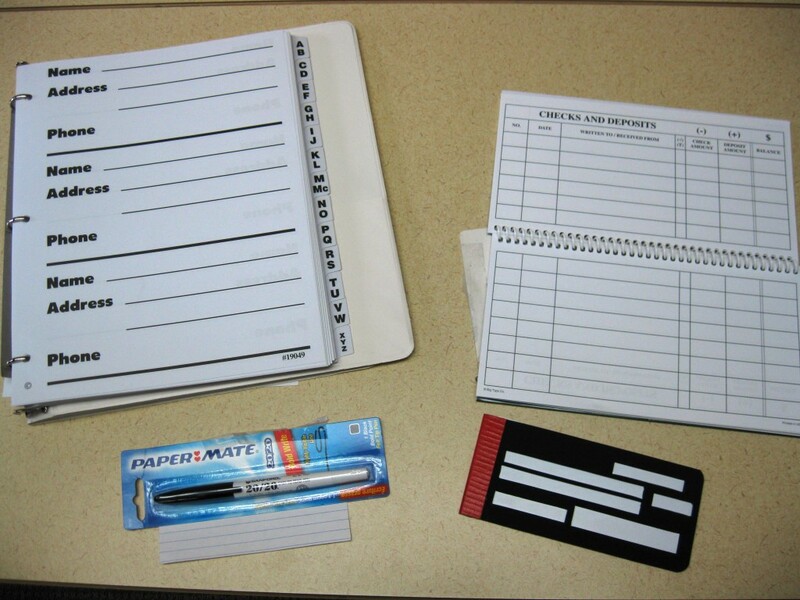 Check writing guide with plastic back to help keep checks in place when writing. A handy way to keep track of your check register. Embosses tape on 1/2 inch or 3/8 inch labeling and magnetic tape. Upper rim of dial brailled, lower rim of dial displays standard alphabet. Can also be used as a standard print labeler and with a standard alphabet dial. Comes with one spool of vinyl tape. Introducing the all-new, upgraded PenFriend2 Voice Labeling System! This low cost, audio labeler for the blind and visually impaired lets you label anything and everything with discreet audio labels all in your own voice. Easily record and re-record information using this versatile, pocket-sized, easy-to-use labeling system. You can instantly play back the recordings anywhere simply using the PenFriend2 – no computer required. The upgraded PenFriend2 is slimmer in design than the original model and has four simple yellow tactile operating buttons that contrast against the black casing of the device. These buttons are designed to make it easier for the blind or visually impaired user to locate and use. Use to label food/freezer items, film/music collections or household objects. Organize letters and other paperwork. Record shopping lists or leave audio messages, or use it as a portable note-taker at the office or classroom – just record your message and keep track of it by placing the allocated label in a small notebook or on the item. 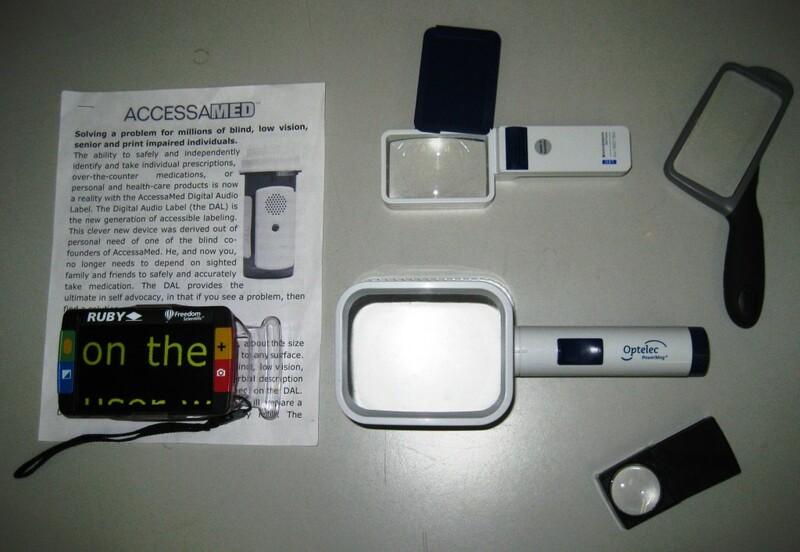 Comes with 4GB internal memory, 127 colored labels, 3 magnetic badges (great for using on tins), neck lanyard and 2 AAA batteries. Also includes free ‘PenFriend sticker management software’ which works with JAWS screen reader and free CreateLINK software to access sound enabled books, posters or maps. You can also download MP3 files (books and music) from your computer using the management software (USB cable “Eye Can” Aids & Appliances Catalogue 13 required to connect device to computer – not included). 1-Year Manufacturer’s Limited Warranty. Labels cannot go into the washing machine To use, simply allocate one of the coded self-adhesive labels and record and store your message on the PenFriend2. To play back, hold the PenFriend2 over the label – it announces recordings specific to each label. There is no limit to the length of each message. Auto power-off after 3 minutes. Extra packages of labels can be ordered. Check for price. Please note: due to the unique codes embedded in the labels, only one set of each label pack can be used with each PenFriend. Please purchase the packs in order: Pack A, followed by Pack B, then Packs C, D, E and F.
Easy to read, enlarged format, spaces 1/2 inch apart offers ample room for large lettering or handwriting. Heavyweight paper so writing will not bleed through pages. Address book with giant print done in a loose leaf notebook format. Holds a total of 234 names and phone numbers; Spiral bound 8-1/2 inches by 11 inches; inner pockets for storage on spill-resistant front and back covers. Time announcement in a British male voice, Separate announcement for date announcement, Choose from 11 alarm sounds with 10-minute snooze, Uses 9V battery not included. Date announcement sample: “24th of September, 2010” Time Announcement Sample: “5:20pm” Includes protective plastic cover to prevent accidental button presses. The Date and Time buttons are accessible with the cover on. 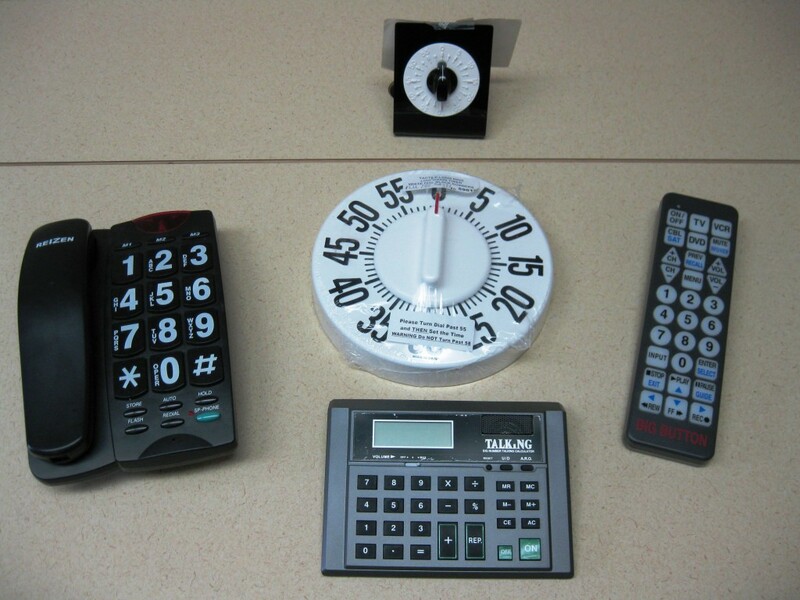 The tactile long ring, low vision timer has an 8 inch diameter, 1-1/4 inch numbers. Bold, easy to read, tactile numbers. Easy to use by those with weak hands. Displays and announces time. Alarm clock feature talks and crows. Compact 2-1/4 inches high by 1/2 inch wide by 1-1/2 inches deep–fits easily in pocket and purse. Batteries included. 90 day warranty. 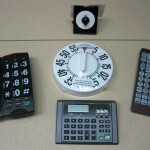 Large bold number timer with wall mount. All watches are battery operated. Batteries are included. ABVI does not sell replacement batteries. Male voice announces time when you press large front button; optional hourly announcement; 3 alarm sounds: beep, rooster, or cuckoo; 1-1/4 inch diameter plastic face and black plastic band with buckle. Round shape watch with large number display, audio time report, alarm and hourly time announce, long-life lithium battery, one-year warranty. A simple turn of the dial allows you to hear the setting for hours, minutes, and alarm functions. Return the dial to normal position and the watch cannot be accidentally reset. Rectangle shape. Large number display, audio time report, alarm and hourly time announcement, long-life lithium battery, one-year warranty. Talk button on the side. Easy-to-set. Hear the time in a male or female voice. Press the button to hear the time announced; press again to hear the date announced. This watch, if not running when received may have arrived in sleep mode. To make active, simply press the S1 button (next to 2 o’clock) for 2-3 seconds or until hands begin spinning. See manual for further details and instructions. All watches have expansion bands. The face measures 1-5/8 inch diameter; quartz movement; stainless steel back, expansion band. E-Z Read numbers are approx. 1/2 inch tall and color coded for easy identification. Also includes pour spout for easy pouring. Four different sizes 1/4, 1/3, 1/2 and 1 cup. E-Z Read numbers approx. 1/2 inch tall and color coded for easy identification. 4 spoons. 1/4, 1/2, 1 tsp. and 1 tbsp. Provides good contrast for measuring things that are light-colored; set includes 1/4, 1/3, 1/2, and 1 cup. 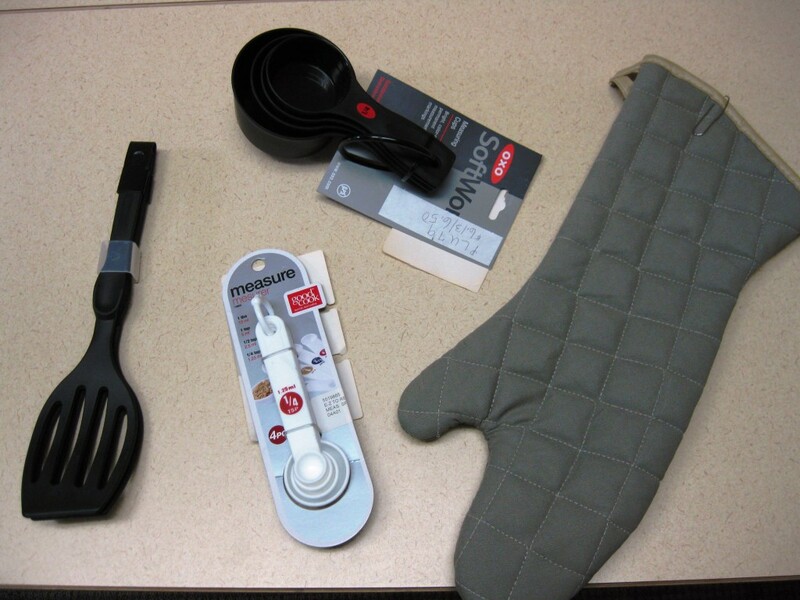 Black plastic measuring spoons; set includes 1/4, 1/2, 1 teaspoon, and 1 Tablespoon. The unique design and a dripless spout allow the user to control liquids and dry goods as they pour them after measurement. The measuring cup set includes 9 pieces, ranging from 1/8 cup to 2 cups. All cups are labeled with Braille. These measuring spoons are accurate. The spoons are heavy stainless steel, with easy to read measurements. The solid handles allow the oval measuring spoon to rest on a counter without tipping. The long, oval shape is perfect for dipping into jars. They are dishwasher safe and have a 25 year warranty. Sizes: 1 tablespoon, 1 teaspoon, 1/2 teaspoon, 1/4 teaspoon, and 1/8 teaspoon. Measurements are permanently stamped on spoon handles. Set nests for storage and attaches to a removable loop. Use as tongs or separate for single spatula use. Dishwasher safe. 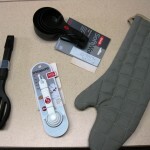 Triple layer heat, flame & steam protection; Five finger flexibility; Protection up to 540 degrees F; Non-slip silicone grip. Never again risk the embarrassment and inconvenience of overfilling your dinner glass or coffee mug with this alerting liquid level indicator. Hang this device on any cup or glass with a rim thinner than 3/8 inches and you will know when to stop pouring. A chirping noise is sounded when the primary sensors are touched by liquid. If the liquid continues to be poured and contacts the secondary sensor, a higher-pitched chirping noise warning you to stop will be sounded. Durable pollyboard. Will not dull knives. Has handle for easy carrying. Flip over for your choice of color. Standard large print markings with tactile indications. One small hole every 1/2 inch and one larger hole at every 1 inch. Double holes every 12 inches up to 5 feet. 3-dimensional for raised lines, dots and shapes; looks like plastic; nontoxic; great for letters, line art, small shapes, dots, maps, designs. Very tactile after thoroughly dried. 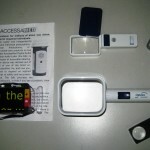 Use to identify clothes and many other items. One oz. tube. Dots that can be used for marking typewriter keys, etc. Six per pkg. Dots that can be used for marking typewriter keys, etc. Twenty per pkg. The Colorino Color Identifier-Light Detector discerns and clearly announces up to 150 shadings – not just red, for example, but pale red, light red, dark red, as well as intense red. It also detects the presence of light and indicates intensity and proximity by audio signal. Big buttons, fully lighted; works on TV’s, DVD’s, cable, and satellite. LED signals incoming calls; high volume receiver; 10-memory storage; receiver volume control; large numbers for easier dialing; hands free answering; in-use indicator. Ringer, high-lo-off switch; flash button; last number redial. The Panasonic DECT 6.0 cordless telephone lets you move freely around your home with long range and amazingly clear sound. This phone has features that are extremely beneficial for hard of hearing and low vision individuals, including a lighted keypad, talking caller ID in the base and handset, inbound sound amplification, speaker phone amplification, a visual ringer, and adjustable ringer volume. This blank cartridge is for use with the National Library Service (NLS) Digital Talking Book Player. 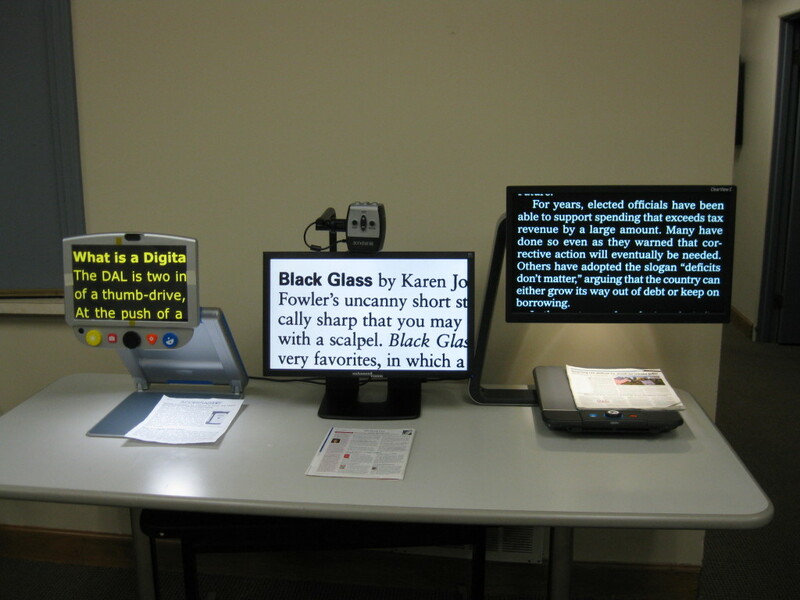 The digital cartridge is a new medium for playing digital talking books and magazines. Features: Connect this cartridge to your PC via USB cable (sold separately) to download NLS books (you must be an authorized NLS user). The cartridge can then be disconnected from your PC and plugged into any player that will play NLS books or the NLS digital player to play back the downloaded material. Large capacity: 4GB blank cartridge will hold approximately 40 NLS Talking Books or hundreds of Daisy Text Files. Cartridge is green in color. Now with twice the storage. Micro-Speak Plus is a brand new digital voice recorder that combines smart design with ease of use and high quality performance. 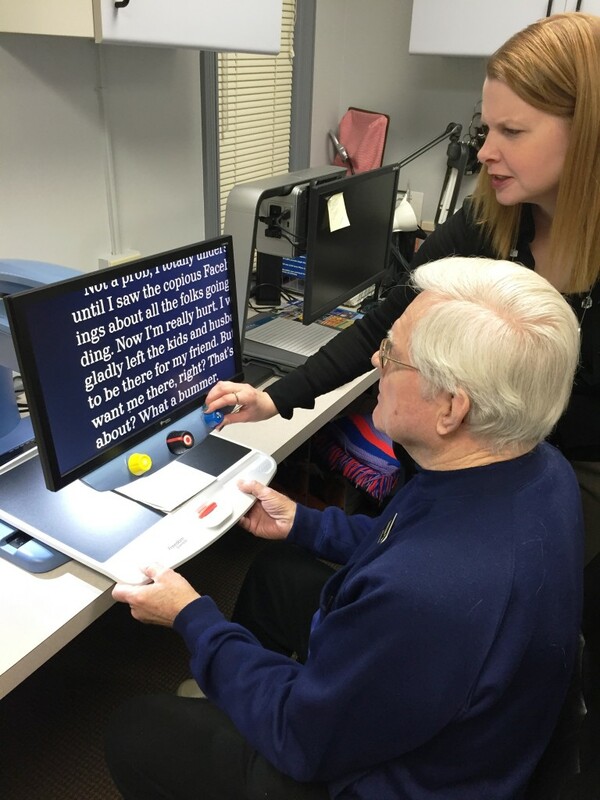 Micro-Speak Plus is packed with useful features including specifically designed software that provides spoken prompts and beeps to assist blind and low-vision users. Record with the press of a button and playback immediately via the built-in speaker. High Definition recordings in uncompressed WAV format ensure impressive results for unlimited speaking and listening activities. Will store multiple messages (Note: When recorder is full, oldest messages will be deleted). For easy, accurate and safe eyedrop application. 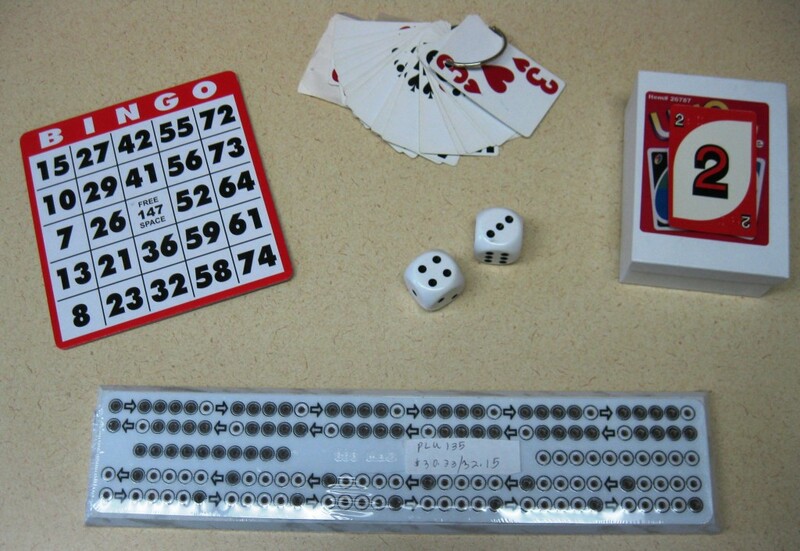 Bingo board with braille numbers and markers. Large, sharp, bold black numbers on a white background are easier to see than on a standard Bingo card. Laminated for durability. Card measures 11 inches by 17 inches. 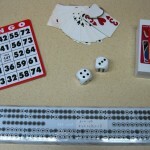 Bingo boards with large print. Tactual plastic checkers and board. Heavy duty, white plastic, tactile for easy identification of pieces. Small dice with tactual markings. Two per set. Game has round and square pegs for easy tactual identification. America’s popular card game for two to ten players. Popular card game. Cards have braille. Measures 15-1/2 by 3-3/4 inches. Includes wooden pegs. Playing area is outlined by raised circles. Game pieces fit in sliding compartment on underside of the board. Each player or partner is dealt a stack of cards and then has to try to win by playing all those cards and building piles in numerical sequence. Ages 7- adult. 2-6 players. Cards have braille. Braille instructions included. Cards with print and braille. Cards measure 2-1/2 inches by 3-1/2 inches; 1-1/4 inch numbers and letters. Each suit is in a different color to aid in identification. Each card holder holds up to 15 cards. It can stand on the table or hold it in your hand. Organizes hand for easier play; two holders per set.